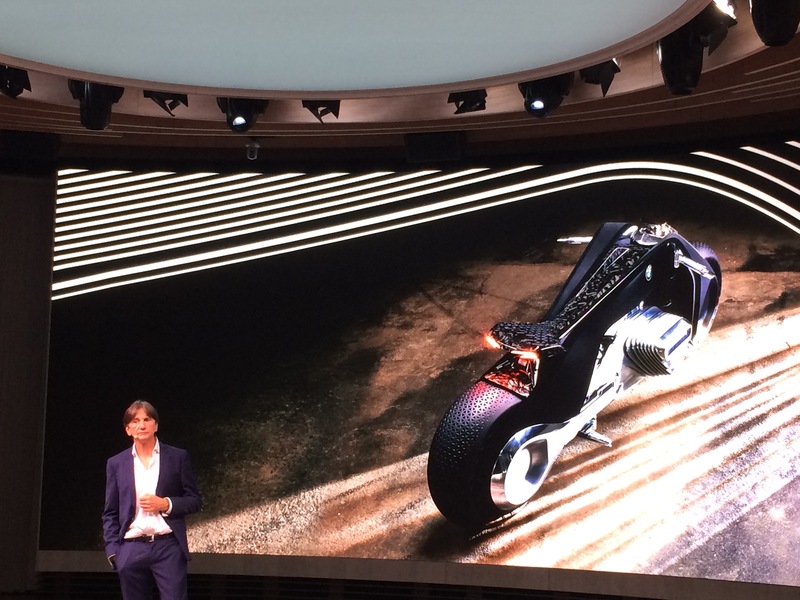 BMW showed off its Next 100 motorcycle here in Los Angeles just now, and it’s the company’s vision for how things might be for riders in the next 100 years. The bike is self-balancing, powered by an alternative fuel source of some sort that includes a flexible engine, with a flexible frame and all instrumentation available through a heads-up display on a pair of goggles. Safety equipment is not needed because the bike won’t crash – it’s too clever for that. It knows what’s around it and what’s coming up on the road ahead. We’re going in now to talk to executives in exclusive interviews, so for now, don’t take our word for it: here’s the press release, with everything you could want to know about the new concept bike. BMW’s head of motorcycle design, Edgar Heinrich, introduces the Next 100 concept bike by comparing it to the original 32 design from 1923. Munich/Los Angeles. In 2016, its centenary year, the BMW Group is looking further into the future than ever before and developing a series of Vision Vehicles to address people’s mobility needs in about three decades from now. Its solutions are based on the assumption that mobility is set to become increasingly multifaceted and connected. 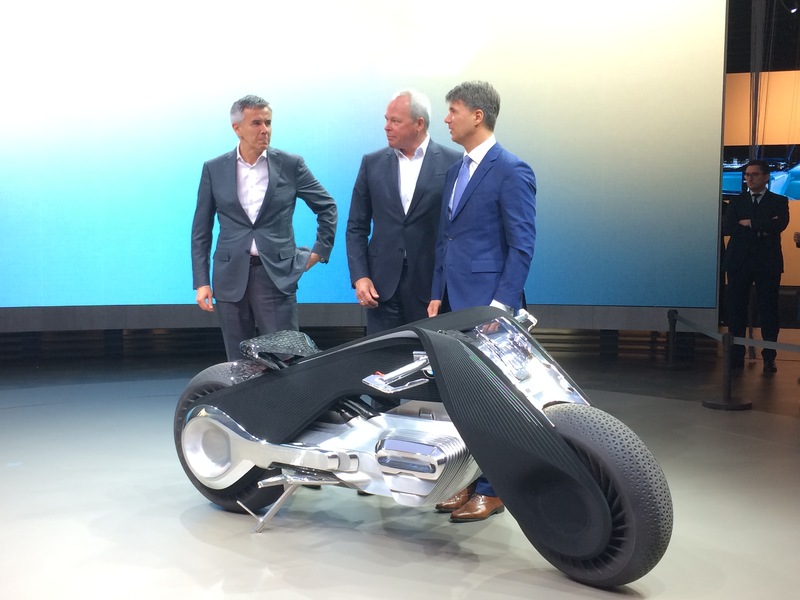 Very Important BMW executives stand proudly with their concept bike of the future. They didn’t actually sit on it, though. Edgar Heinrich, still introducing the Next 100. Looks pretty spartan on top of that bike, but that’s the whole point. 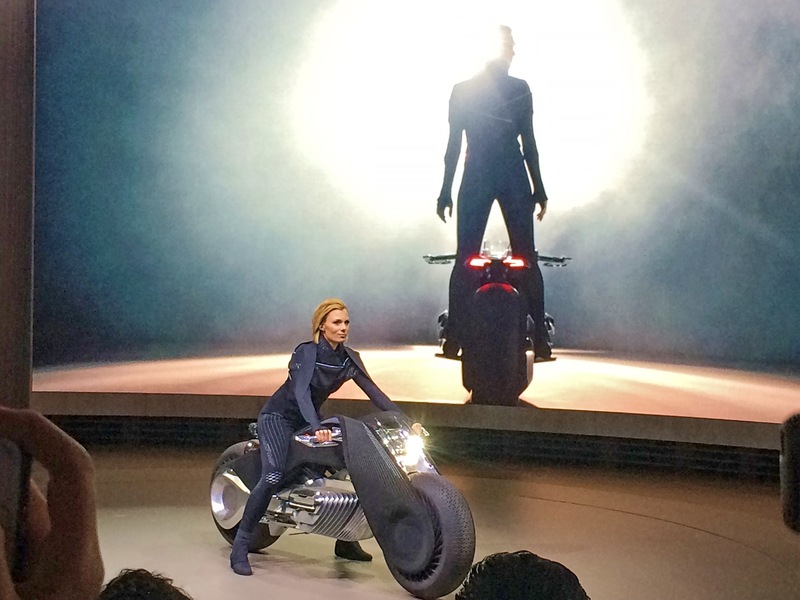 What kind of world will be home to the motorcycle of the future? “Normally, when we develop a motorcycle, we tend to think 5 to 10 years in advance. On this occasion, we looked much further ahead and found the experience especially exciting. There are some very attractive prospects. 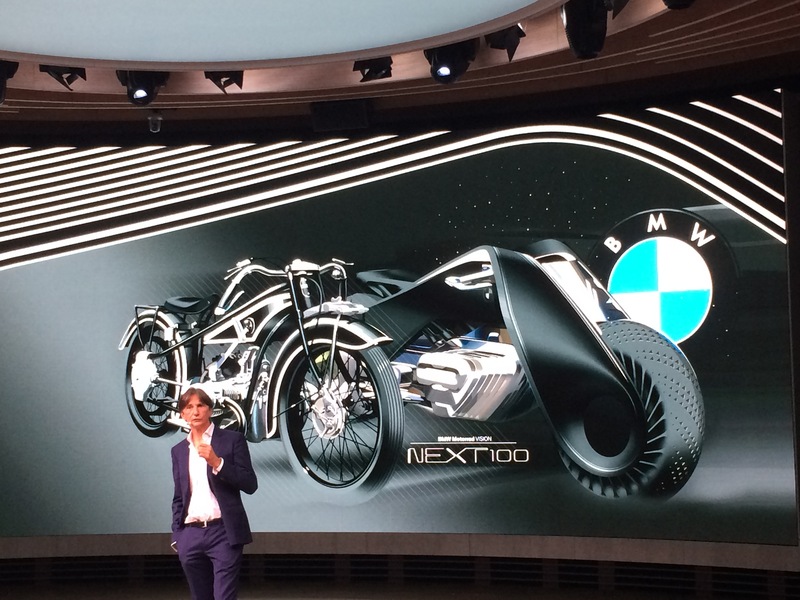 I firmly believe the BMW Motorrad VISION NEXT 100 sets out a coherent future scenario for the BMW Motorrad brand,” explains Edgar Heinrich. Previous PostPablo Quintanilla is FIM’s Cross Country Rally champNext PostWho is that woman on the BMW future bike? The Dude does not abide ! The arrival hits all the high notes but the bike misses out on one, would I want to live with it? I love innovation and I look forward to parts of the concept making into ‘my next bike’ but real world environmental changes and our personal habits would inspire aggravation with the functionality described. Compare any two riders, their gear, riding styles, proficiency, do they like visor up riding over visor down. I personally desire a feeling of being comfortably wrapped into my bike. Remember, there is a passionate emotional human being saddled up on top of these steeds, and for me my ride should feel like an extension of my body, responsive to my inputs, we are connected almost viscerally. For a newbie, there are loads of intelligent ideas here. An unprotected rider seems lovely but if my intelligent bike even had the ability to avoid the distracted soccer moms Caravan, physics says even if the bike could dodge the Dodge, I am going to continue forward flying solo. You can’t get to second base without taking your foot off first, and they’ve done that. It’s to be applauded, I just can’t help but feel in the pursuit of the engineered convergence of what we can now accomplish they forgot about the rider. I need to see and feel what the press release describes, I want to, but from the vantage of the photos I question whether true riders where manning the engineers keyboards. PS. I am an owner of two BMWs and if I could I would own a few more. I consider the brand the finest engineered and reliable performance bikes made. Ride one once and you’ll likely agree. The reason you won’t need rider protection is because the Holo-Suite has rubber walls.